"Finally another quality title for our younger PS2 players." 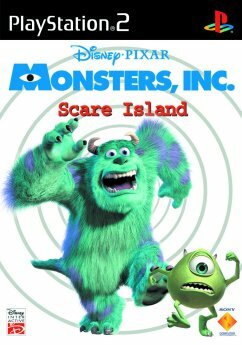 Combining the joint efforts of Pixar and Disney, the people behind Toy Story, we are presented with Monsters Inc. This great animated film is about the monsters under the bed and in the closet, who, by the way, are more scared of us than we of them. Our heroes being monsters are Sully and Mikey (ably voiced by John Goodman and Billy Crystal) and their job is to scare Nervs (robots who are training tools in their quest to be good Scarers.) By picking up goo and other devices our monsters have the potential to successfully scare braver Nervs and proceed to the next level of the game. impulsegamer was disappointed to read in other publications the low score for this title. It is a port of the PSOne game and is a lot of fun. Bear in mind that it is definitely a game for players between 5-12 years old. For anyone else it may tend to get a bit repetitive. Considering the total lack of games for younger players both Sony and Disney Interactive are to be commended for releasing this title on the PS2. Character animations are guaranteed to give a chuckle and some of the final "scares" are hilarious! Graphically the title is nice to watch and controls are made simple for the intended younger audience over the top and some of the limitations of a direct PSone port do show. A word to the wise, when starting the game push the D pad downward, this will give you access to the exclusive DVD content on the disc and the extras there themselves are worth the price of admission. You can see concept art, tour Pixar, interviews and a host of other great things. Monsters, Inc. Scare Island is a treat for younger players and the DVD content a delight for everyone. Another nice thing about this title was the fact that Sony, appreciating the younger audience lowered the recommended retail to $79.95 which is almost unheard of with a brand new PS2 title. We can only hope that other publishers learn from this. Bravo!